Pos Photos Privacy Keeper Main Window - PowerOfSoftware Ltd. - Protect and restrict access to your photos. With Pos Photos Privacy Keeper you can easily protect your photos from unauthorized view. 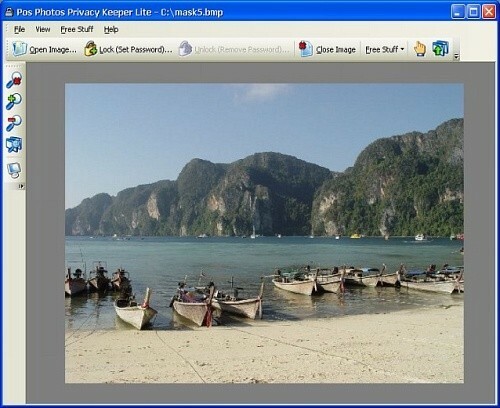 Pos Photos Privacy Keeper allows you to add password to most of standard image file types. After the locking action each view of the image will require the password to protect your privacy. Better protect your privacy using dummy images: Pos Photos Privacy Keeper allows you to attach dummy image to the image you wish to protect. In case someone will force you to show him the content of the file you simply fill in the dummy password (instead of the real image password) and all he will see will be the dummy image. Pos Photos Privacy Keeper is a great value for everyone who wishes to protect his photos from curious eyes. Pos Photos Privacy Keeper is very easy to use. All you have to do is open the image you wish to password protect, click on the lock button, apply the password and confirm - that simple.